Kyla Naylor has a Bachelor of Human Kinetics from the University of Windsor, a Masters of Environment and Sustainability from Western University, and a PhD in Epidemiology and Biostatistics from Western University. Her PhD thesis focused on examining the epidemiology of fracture in adults with kidney disease. She recently completed a three year postdoctoral fellowship at the ICES, Kidney, Dialysis, and Transplantation Program and at the Institute for Health Policy, Management, and Evaluation at the University of Toronto. Her postdoctoral research focus was on post-transplant outcomes and on improving access to kidney transplantation. 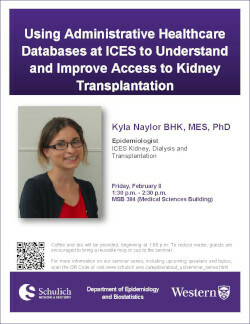 Currently, Dr. Naylor is an Epidemiologist at the ICES, Kidney, Dialysis, and Transplantation Program located in London, Ontario. At ICES she is continuing her postdoctoral research and is continuing to assist investigators with their transplant related research. Coffee and tea will be provided, beginning at 1:00 p.m.
To reduce waste, guests are encouraged to bring a reusable mug or cup to the seminar. All are welcome. View the complete Seminar Series Listing.